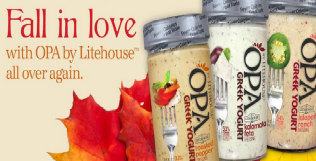 Litehouse Foods “Fall In Love with OPA by Litehouse™ All Over Again” Sweepstakes – Win a $150 Visa gift card! 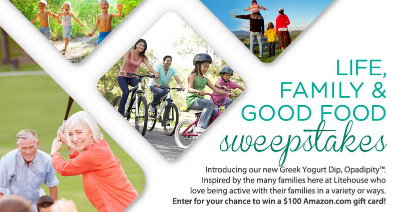 Win a $150 Visa gift card for groceries (3 winners)! ELIGIBILITY – The Promotion is open only to legal residents of the United States and the District of Columbia, (excluding Puerto Rico and any other U.S. territories) and Canada (excluding Quebec) who are 13 years of age or older and have reached the age of majority in their state as of October 7, 2014. SWEEPSTAKES PERIOD – The Promotion begins at 11:59:59 AM Pacific Time (“PT”) on October 7, 2014 and ends at 11:59:59 PM PT on October 14, 2014. PRIZES – Three (3) $150 Visa® gift cards awarded digitally and sent to winners via certified mail. 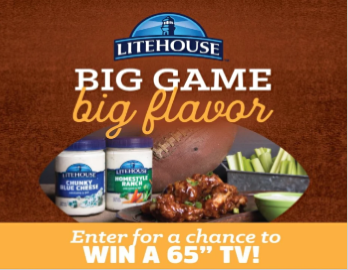 Litehouse Opadipity – Life, Family, and Good Food Sweepstakes – Win a $100 Amazon gift card! Win a $100 Amazon gift card (5 winners)! ENTRY LIMIT – Vote by entering your email address and entrants are eligible for one (1) entry per day. ELIGIBILITY – The Promotion is open only to legal residents of the United States and the District of Columbia, (excluding Puerto Rico and any other U.S. territories) and Canada (excluding Quebec) who are 13 years of age or older and have reached the age of majority in their state as of August 10, 2014. SWEEPSTAKES PERIOD – The Promotion begins at 10:40:01 AM Pacific Time (“PT”) on August 11, 2014 and ends at 11:59:59 PM PT on August 17, 2014. PRIZES – Five (5) $100 Amazon.com® gift cards awarded digitally through the entrants email. Winners will be announced August 18, 2014.